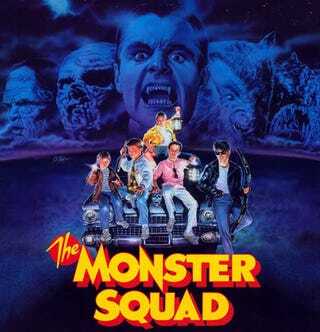 First up for me is The Monster Squad. Duncan Regehr is still one of my favorite Draculas. I would beg my Mom to rent it every time we went to the video store (that's right, VHS is where it's at.) And of course one of the best movie lines of all time "Wolfman's got nards!" Next up is the The Goonies. Pirates, scary deformed guys in the cellar and the truffle shuffle. What more could an 8-year-old boy want in a movie. Masters of the Universe. Was it the cheesiest cheese fest ever? Probably. But Frank Langella's Skeletor was awesome. And it stared Monica Geller and Tom Paris. So there. Adventures in Babysitting. I had such a crush on Elisabeth Shue. And The Neverending Story. Actually a pretty intense movie for kids, but one of my favorites. There were also numerous animated movies, like both the G.I. Joe and Transformers movies, as well as The Secret of NIMH. But these are some of the live action movies that provide fond memories. So what movies wore out your VCR (or DVD player for you younglings?) Pictures and videos are always welcome.